Vicki has had a long association with education, starting to teach the flute at the age of 14. 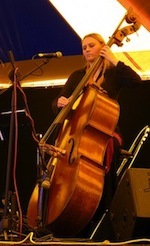 Having completed her music degree she went on to gain Qualified Teacher Status specialsing in Instrumental tuition, then postgraduate solo double bass playing at the Royal College of music and finally completing her Masters Degree in Online Music Tuition. Having completed her studies in classical double bass, flute and piano, Vicki moved over to the folk scene and now also plays the Scottish smallpipes, Swedish nyckelharpa and Swedish bagpipes. Speaking fluent Swedish and brough up surrounded by Swedish traditions Vicki is perfectly placed to perform and teach Swedish music. Vicki's latest project is to increase the popularity of the Swedish Nyckelharpa by running a series of workshops with instruments provided in and around the folk festival circuit.